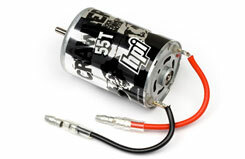 All Products > "102279 HPI Racing 55T Crawler Motor"
HPI Racing 55T Crawler Motor. Ideal for rock crawling fans, this 55-turn motor features a high number of winds for extra torque when climbing steep hills and tough terrain. Use this for your home-built crawler project or Wheely King fitted with the #87632 Wheely King Complete Rock Crawler Conversion for the best combination of power, grip and ability!